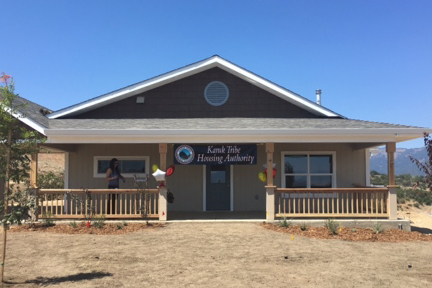 Last week, the Karuk Tribe Housing Authority (KTHA) hosted a grand opening to celebrate its first Low Income Housing Tax Credit (LIHTC) project, Karuk Homes #1, located on Karuk Tribal Trust Land in Yreka, CA. In attendance were local community members, new tenants, Yreka local officials, tribal housing board members, tribal council members, project partners and more! The grand opening ceremony began with a prayer in the tribe’s native language given by Sonny Davis. Elsa Goodwin, board chairperson, and Erin Hillman, KTHA executive director, spoke about the project and thanked everyone for their hard work. I have been honored to work with the project team from start to finish, and I was so happy to be joining the celebration. In recognition of KTHA’s incredible accomplishment, we presented the board with a watercolor of one of the beautiful homes that my mom, Kathy Bourgeois, painted. After the speeches were completed, attendees were able to tour one of the new homes and enjoy some celebration cake. Our Travois design team designed the homes, which have either three, four or five bedrooms. Here are a few photos from the tour, and you can read more project details on the Karuk Homes #1 project page. We were thrilled to have had the opportunity to work with KTHA. While this was KTHA’s first LIHTC project, it has extensive experience developing and managing affordable housing projects and maintains a portfolio of more than 180 affordable housing units developed in the last three decades. Additionally, in the last ten years alone, KTHA has developed five multimillion dollar community structures that serve its affordable housing units. Many are built and maintained by their in-house force account crew. We are so proud to be your partner! Congratulations again!